Gardening’s newest wunderkind is biochar, touted as being able to preserve soil fertility almost indefinitely while, at the same time, making a dent in carbon dioxide production that leads to global warming. Biochar’s origins go deep into the Amazon, where soils are naturally low in fertility. There, explorers recently discovered regions of dark, fertile soil that were deliberately created through the addition of charred wood. Such soils are also found where vegetation was naturally or deliberately burned over. Let’s go back to high school chemistry for some understanding of biochar. Biochar is, essentially, charcoal that is made by partial burning of wood, straw, corn stalks, or other organic materials. Charcoal, especially the activated charcoal used in chemistry, is riddled with tiny holes that can adsorb nutrients. (A single gram of activated charcoal has enough internal surface area to cover a tenth of a football field!) In the soil, biochar, similar to activated charcoal, can adsorb nutrients, provide habitat for soil microbes, and increase aeration. Biochar is very resistant to decomposition, which leads to its other touted benefit, carbon sequestration. It locks up organic carbon, formed when plants take in carbon dioxide for photosynthesis, so that it’s not re-released into the atmosphere as carbon dioxide when dead plants decompose. Let’s say you had a pile of wood that you could grind up and make into compost, or that you could burn to make biochar. Which use is better? In soil, both compost and biochar would cling to nutrients. Compost would enrich the soil with nitrogen and, very important, provide food for beneficial soil microbes which would, in turn, feed plants. Microbial byproducts also help give soils that crumbly structure loved by plants and sought after by good gardeners. Many of the benefits of compost accrue as it decomposes, which is why it needs constant replenishment. Biochar has the leg up on longevity, some kinds lasting hundreds of years. So which is the better use of organic wastes? Compost is definitely good for the soil. Ongoing research will tell whether also using a bit of biochar is also worth the trouble. For more about biochar, see http://www.biochar-international.org/. Turning to more immediate concerns . . . My hopes to be eventually and happily drowning in fragrant lilies were dashed by the blue flowers recently brightening the sunny window “greenhouse” in my basement. For explanation, let’s backtrack to last autumn. Summer’s lily flowers — intoxicatingly fragrant, large white trumpets of the variety Casablanca — were long gone but the plants’ tawny flower stalks and seed capsules were still evident. Wouldn’t it be awesome, methinks to myself, to make every August a heady month by overrunning part of the garden with Casablanca? Digging into the dirt around those tawny, old lily flowerstalks easily turned up a slew of healthy little bulbs, which I potted into cell packs and put near that cool, basement window. Leaves appeared a few weeks ago, foreshadowing oodles of lily flowers a couple of years hence. It was not to be: Those small bulbs at the base of the lily stalks were NOT lily bulbs; they were chionodoxa (glory-of-the-snow) bulbs. Not that chionodoxa isn’t a pleasant little flower, and it appears at a time of year when any flower is most welcome. But it ain’t no lily. I should also explain about that sunny window “greenhouse” mentioned above. 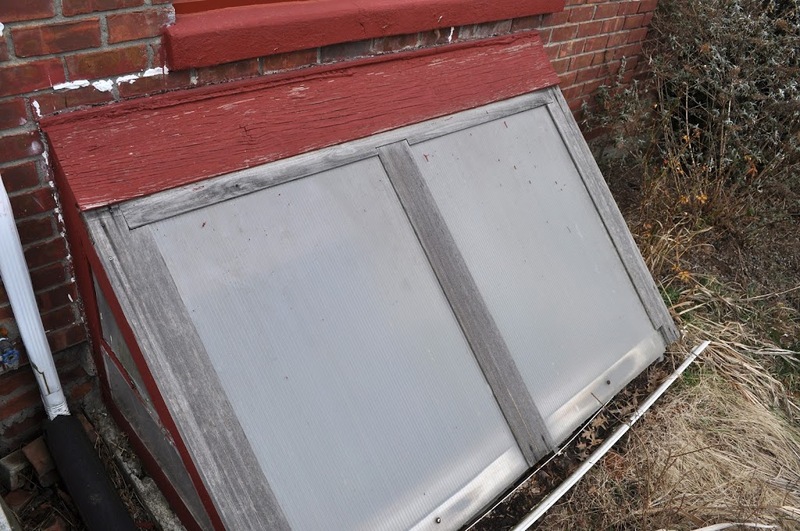 Like many older homes, mine used to have a metal Bilco door that opened into the barely heated basement. Much of the heat in the basement was lost due to the conductivity of and small openings in the Bilco door. Those openings also provided entryway for an occasional snake or other small or thin creature. Many years ago I decided to make use of the southern exposure of that Bilco door. So I ripped out the door, enlarged the opening with additional concrete blocks and a (semi-)waterproof coating of ThoroSeal. I then built a cedar frame into which I slid two large sheets of Exolite, a double-walled polycarbonate plastic material used for greenhouses. Voila! I had a place to keep plants cold, but not frigid, and sunny. Temperatures in that old doorway hover near freezing on cold winter days and nights. 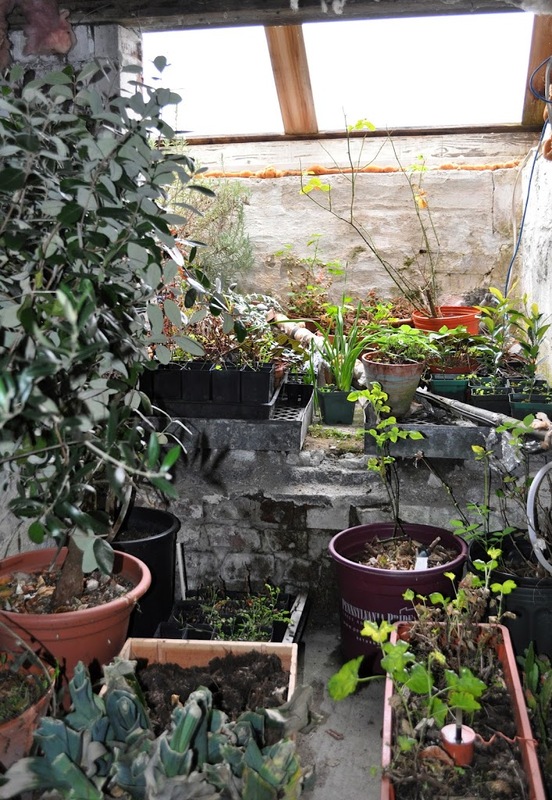 The location has proved ideal for overwintering geraniums, semi-hardy cyclamens, subtropical pineapple guavas and an olive tree, and various other plants that need light and need or tolerate cool winter temperatures. 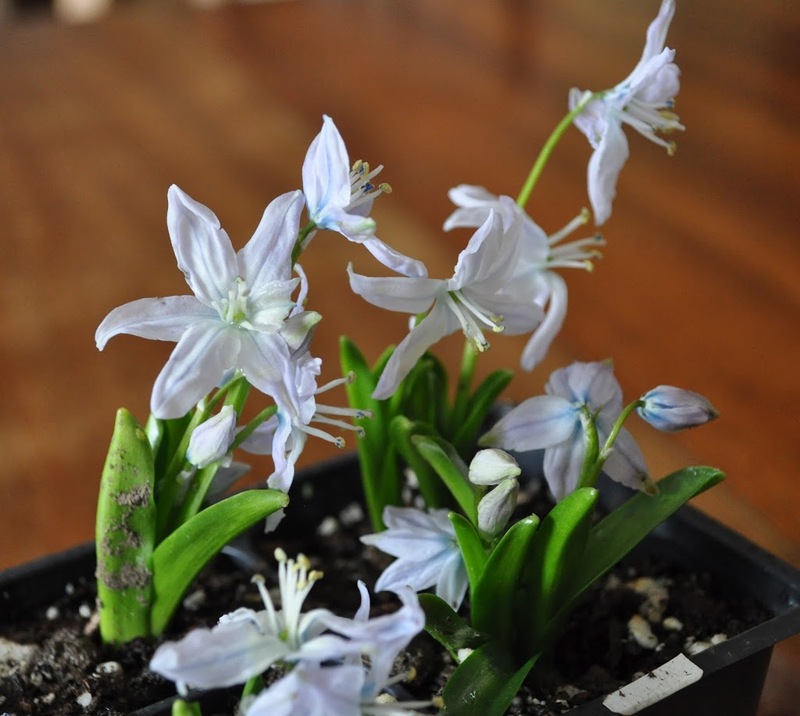 Chionodoxa also does very well there. This entry was posted in Uncategorized and tagged basement window greenhouse, biochar, chionodoxa, Grow Fruit Naturally, lilies. Bookmark the permalink. Trackbacks are closed, but you can post a comment.